Adding proven veterans in trades and free agency has allowed the Philadelphia Eagles to stick to their philosophy of selecting talent over need in the NFL draft. Focusing on filling a hole at a specific position hasn&apos;t worked out well for Philadelphia. Two examples this decade were linebacker Marcus Smith (No. 26, 2014) and guard Danny Watkins (No. 23, 2011). STATS) - Quarterback is not a heavily drafted position for FCS schools, but there are a handful of prospects whom NFL teams are taking a close look at this month. North Dakota State&apos;s Easton Stick, South Dakota State&apos;s Taryn Christion and Central Connecticut State&apos;s Jake Dolegala headline the class. Stick is generally considered the most likely to be drafted in the April 25-27 extravaganza. Eagles Jalen Mills issues apology after arrest last weekend originally appeared on nbcsportsphiladelphia.com Three days after he was arrested outside of a Washington, D.C. nightclub for disorderly affray, Eagles cornerback Jalen Mills has issued an apology. Mills was arrested near 3 a.m. on Saturday morning after a fight with professional basketball player Devin Robinson, with whom the Wizards cut ties in the wake of the incident. 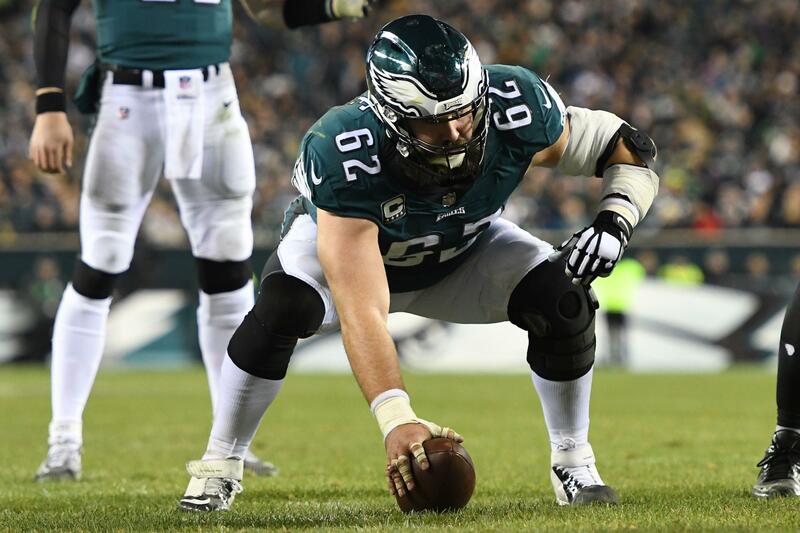 Philadelphia Eagles center Jason Kelce revealed on Monday that he played in 2018 despite three significant injuries, including a left elbow injury that required him to wear the bulky brace seen here. Jason Kelce is already a Philadelphia legend, mostly for his amazing Super Bowl parade speech - and, yes, his high level of play. The Eagles, like many NFL teams, opened their offseason program on Monday, and made three players available: Carson Wentz, Zach Ertz and Kelce. Philadelphia Eagles quarterback Carson Wentz says the stress fracture in his back hasn&apos;t fully healed, but he still plans to be ready for the start of organized team activities next month. "It&apos;s still getting there," Wentz told reporters Monday when the Eagles began their voluntary offseason program. Wentz, 26, was diagnosed with the injury in mid-December and missed Philadelphia&apos;s last three regular-season games and both playoff contests. NFL Rumors: Tom Brady, Michael Bennett skip Patriots voluntary workouts originally appeared on nbcsportsboston.com Brady wasn&apos;t expected to attend, while Bennett, acquired in March in a trade from the Philadelphia Eagles, typically spends his offseasons working out in Hawaii. ORIGINAL STORY: To the surprise of no one, Tom Brady won&apos;t be showing his face at Gillette Stadium this week. The New England Patriots begin their voluntary offseason workouts Monday, and the 41-year-old quarterback isn&apos;t expected to attend, NFL Media&apos;s Ian Rapoport reported. The New England Patriots have agreed to a one-year contract extension through the 2021 season with safety Patrick Chung, according to multiple reports. Chung, 31, has been a stalwart in the Patriots&apos; defense for much of the past decade. He has played nine of his 10 NFL seasons in New England, appearing in 128 games (100 starts) with 660 tackles, 11 interceptions and 51 pass breakups for the franchise.